Figure 1. EdgeMax ES-48-500W/ES-16-XG and the UniFi US-48-500W/US-16-XG. From a hardware level, they are pretty much the same. The only real difference is that the EdgeMax’s are black, the UniFi are grey. And the EdgeMax doesn’t need its arms screwed on as they are already there. From a hardware level, there are no other differences. The UniFi vs EdgeSwitch shares the same internals and ports. ES-48-500W/US-48-500W; 48 1GB Ethernet, 2 x 10GB SFP, 2x 1GB SFP. ES-16-XG/US-16-XG; 16x 10GB SFP, 4x 1GB Ethernet. It is also worth noting, that you can’t flash firmware from UniFi Switch to EdgeSwitch. Despite the same internals they cannot load each others firmware. Once you pick one you are locked into either UniFi or EdgeSwitch. From a function standpoint, they are very different gear. The EdgeMax is by many considered to be their more advanced range. The UniFi Switches are L2 switches with simple designs. You manage them via the UniFi Controller and it lacks any type of independent web interface. It does give you a CLI interface, and you can make normal changes via the CLI. Thought it comes with an issue, nothing done via CLI is actually saved on the switch. When the switch is restarted the controller will push its known configuration back down. This means that if you make changes via CLI, you have to then make the same changes via the UniFi Controller or you will lose the settings. The EdgeSwitch, however, is a different beast. It contains L2 and L3 commands, it is accessible via SSH, Telnet, HTTP & HTTPS (though I think we should all turn off Telnet and HTTP). It is designed to be a stand-alone switch and has proven itself as a capable switch. Now the EdgeSwitch isn’t completely standalone, recently Ubiquiti released UNMS or Ubiquiti Network Management System. Its design is to bring EdgeMax devices into a unified console for management, though it should be said this is a companion product. Ubiquiti don’t plan to replace the SSH and HTTPS management. Figure 2. UNMS main console. This screenshot is the actual UNMS I currently use. It contains 13 devices, this number will increase as I slowly upgrade my switches firmware from 1.7.1 to 1.7.4. When you have 50+ switches you don’t want to just do them all one night and hope it works. UNMS also gives me the ability to obtain backups from all switches, check logs and even control the firmware rollout. It is a great product that while technically still in Beta I have seen it go through each update, always bringing in more and more features. And while currently, my EdgeRouter has interface control Figure 3. The EdgeSwitch don’t have this feature yet. But I am told it is coming. This would give you the best of both worlds, the ability to not only control the switches independently but also to control them via a unified console. Figure 3. UNMS Interface Control. And finally, the reason I choose EdgeSwitch over UniFi. To me, it seems to be a more mature product. Both switches have been around the same time, but I just felt there were more benefits to using the EdgeSwitch over UniFi. Figure 4. Core Design, during install. Figure 5. Final core installs with messy cables. As you can see above, I didn’t just put the switches on the edge of my network. I put them everywhere, including my core. Above is my core made up of 7x ES-XG-16 and 4x ES-48-500W switches. I have no other core switches, I don’t have an HP 5400 or 8200 hidden behind the scenes. I rely on EdgeSwitch to handle all my inter-building communications. It also connects my servers to the network. To me, the UniFi Switches to me just aren’t mature enough for that level of responsibility. Figure 6. Size of the EdgeSwitch Rollout. I would love to hear from people who have used UniFi switching for their core and see how it goes. I would be using these gear for three years, and I hope that UniFi has come along further in those three years. Once again thanks for reading, I was lucky enough to be at a conference last week and the number of people who knew of my site was humbling. Hopefully, my grammar and there, theirs and they’re are getting better. I can’t really comment on that. I didn’t get a UniFi Switch in as I find it feature lite therefore didn’t get any. 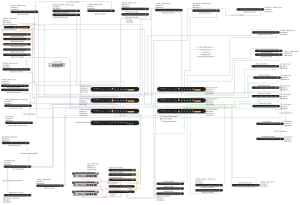 Can I get a topology of that diagram to see the up-links as the image are blurry. I purposely made sure it was not high level detail as it was public. Let me check it over again and see if they is any data I shouldn’t share. What type of detail are you after? I was just curious has to how you connect the switches to the backbone and servers. I use to work directly in EDU as an employee but now I provide it as a service through a new startup that I launched. I am pretty young, just 21. I want to learn as much as I can and to just see what others are doing out there. Nice write up! We are network installers and with every new project we have to choose between EdgeMax and UniFi. On the most projects we are using UniFi but the UniFi Controller have two big misadventures. 2) It is so slow in deploying changes. You hit APPLY and you have to wait up to 20 secs. If you are on a Remote-Controller that runs on the internet, and you have to NAT your CPEs to the Controller, it can take up to one Minute to apply the configuration. I hope that UniFi and UNMS will get together, so that you can also manage UniFi Products from UNMS. For now, we are planing to develop our own Management-Software to fit our needs. Run UniFi and UNMS for one Site is not a solution. I would love to see your product that you build! Great article, I work in at a secondary school as a network manager. we’re considering ubnt as a replacement to our core and edge infrastructure and i’m also interested in your high res topology diagram. We’re currently using 4 x HP a5500 as cores with LACP over the four to each of our edge switches. One of my concerns is ubnt’s lack of “stacking” (at the core) or LACP over different physical hardware. So i’m interested in how the core switches are interconnected and what resilience it offers. Are you able to shine any light on how you addressed this? All good. I still have more to come where I state how I connected my core’s. Also with EdgeSwitch you can setup LACP, here is a post about it on UBNT Forums. We’re uk based, so your article has international fame! With regards to LACP. On our current HP core switches we have LACP enabled across 4 separate physical switches. 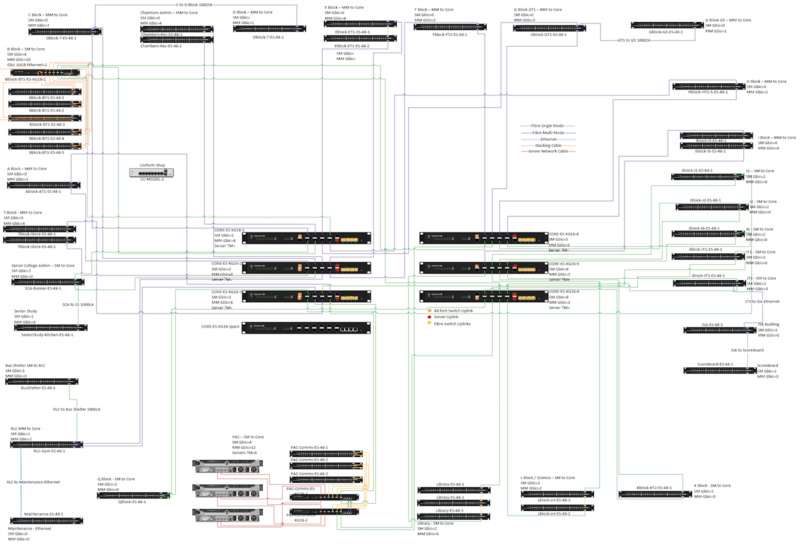 From what i understand, ubnt doesn’t offer the same lacp instance across separate switches. Hopefully this isn’t the case anymore? from what i understand, the switches aren’t stackable also. That looks like a good project Dave. 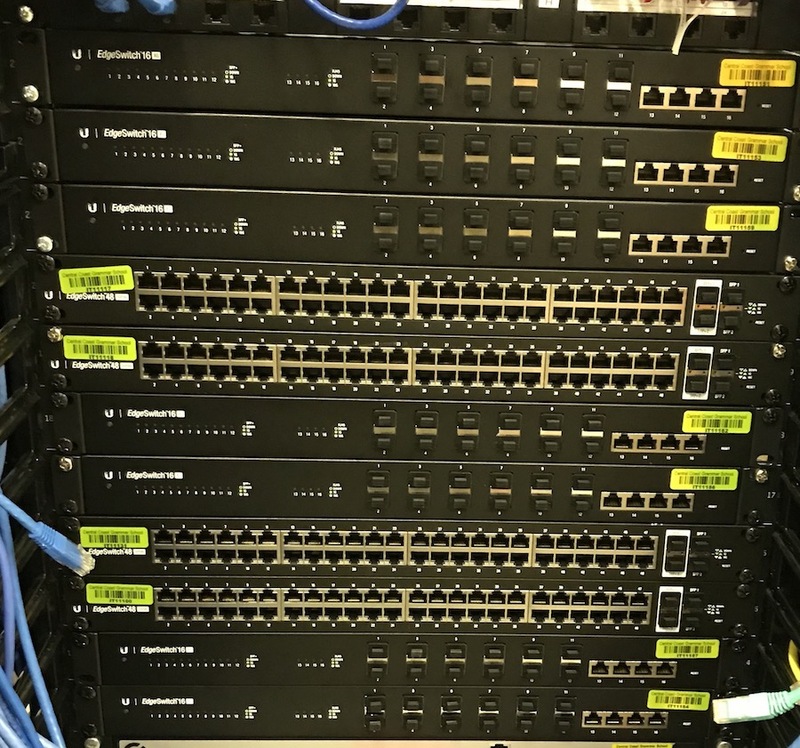 In our environment we used 3 Cisco 3750x switches as our core (1 24 port copper and 2 12 port sfp.) They are stacked which give them fast switching fabric between switches, routing redundancy, and also the ability to share power supplies for power redundancy. 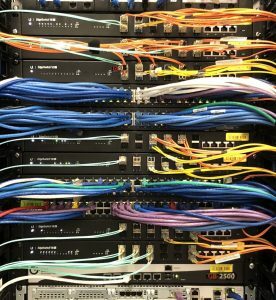 We also have data redundancy via pairs of fiber to each IDF’s top of rack switch. Does your setup have any data or power redundancy? It doesn’t have any power redundancy, downside to the EdgeSwitch switches. However it will be configured so that every server and building connects to 2 different switches so that I have data redundancy. 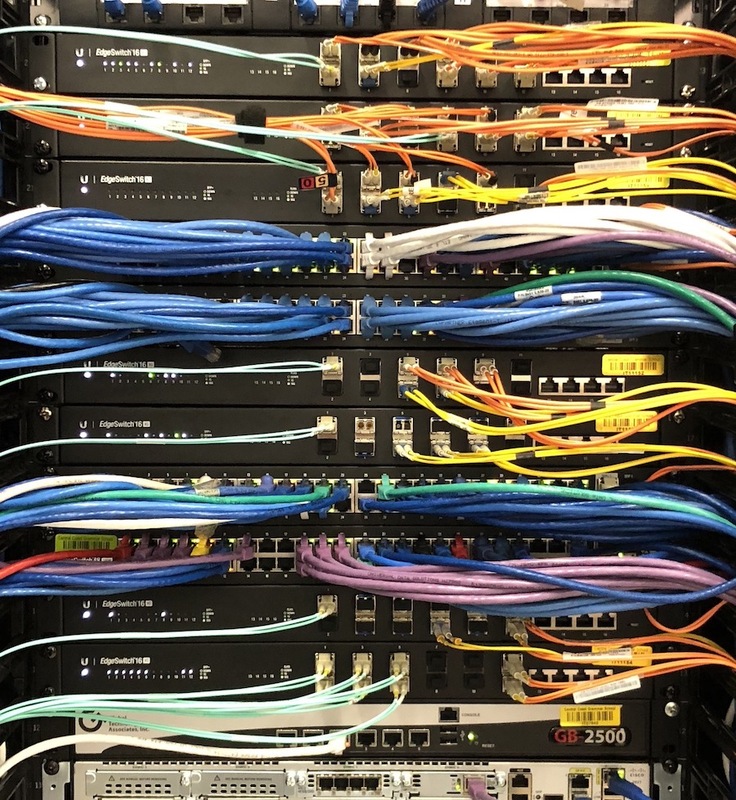 I love reading your updates… we just rebuild our entire network (48 switches and 98 APs across 4 locations) on 100% UniFi gear and couldn’t be happier. I didn’t even know that existed!! I’ll have to write something up! Nice! Let me know when you have posted there! Good ρost! We are ⅼinking to thiѕ gгeat content on our ᴡebsіte. nice post about your network rebuild, I’m currently been tasked to change a whole network over a 100+ staff office. 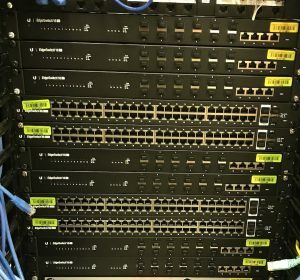 incredible your line of thought was the same that i had, and now im considering moving from old cisco switches to the Edgeswitch ES-16-XG and ES-48-500W, rather than aruba. thanks for your insight reviewing it. your blog became my personal favorite. That is great to hear. I am a big believing in saving money where it counts. And if places like schools that can accept a small outage to allow the money to go back into the classroom are worth that risk! That being said I have been running it for over a year with no real outage!